Last summer, I decided to try something new after having interned at investment banks my two previous summers. Following the advice of M&T Director Dr. Hamilton, I decided to pursue entrepreneurship from the T side because it was what I was more excited and passionate about when it came to my two degrees. 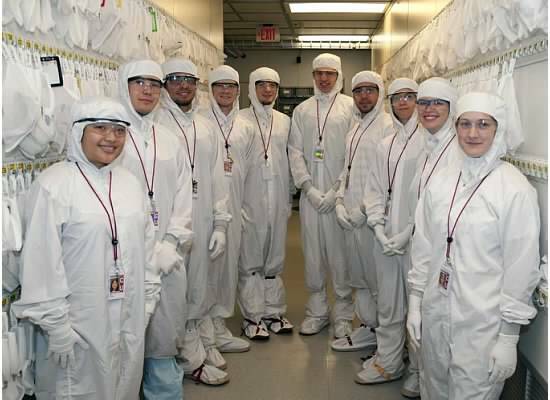 I was placed at Cornell for my NNIN (National Nanotechnology Infrastructure Network) REU internship, where I was initially assigned to a neural probe project for electrical signal detection of the brain. During my first week I had a meeting with the principal investigator of the project, where we discussed my hacking projects at PennApps and PennHacks, which led to the option of exploring a project involving the creation of a novel medical device for surgeons. Because of my previous programming experience, I was able to code a script for rapid prototyping of the device structure, saving time and allowing for a first prototype to fabricated and tested for concept validation. I then had the amazing experience of working in at the Cornell Nanoscale Facility, one of the best academic fabrication labs in the country. There I learned how to pattern microstructures on silicon wafers using photolithography, nitride deposition, and evaporation. Ultimately, the research resulted in integrated silicon medical tweezers for distinguishing cancerous tissue in surgical resections, by which the most critical use is for colon anastomosis stapling site identification. By employing lithographic precision, we were able to embed 28 sensors into the silicon device, making an intuitive interface for surgeons to conduct their operations. At the end of the summer I presented my research in front of an academic audience and got really encouraging feedback on the potential application and use of this device. Did you know that after a public presentation of original research, there is a 12-hour window to file for a patent? So that is exactly what we did. I had to write a proposal on the originality and uses of the device, a process very reminiscent of the MGMT 235 business plan, within three hours of my presentation so that the university patent office had time to process the documentation. Subsequently, the device was presented at the IEEE MEMS 2014 conference earlier this year in San Francisco and won the Outstanding Paper Award out of 325 accepted papers. This experience was the most fun and crazy 10 weeks of my life and certainly career-changing. It made me realize the vast benefits of conducting good research. Not only will there be a contribution to society’s knowledge of science, but there is a possibility of changing the way we obtain initial diagnoses and follow up with earlier preventative care, effectively changing the role that technology plays in our health. Connie graduated from Penn and M&T in 2013 with a Bachelor of Science in Electrical Engineering and a minor in Computer Science from Penn Engineering as well as a Bachelor of Science in Economics from the Wharton School with a concentration in Finance. She currently is an intern at Adamant Technologies, an M&T alumni-advised company and is a National Science Foundation Fellow. This fall she will enter Stanford University for graduate studies. We couldn’t be more proud!